This article is about the coin-generating ? 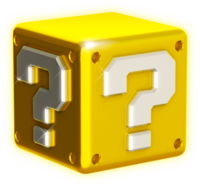 Block that appears in Super Mario 3D Land and Super Mario 3D World. For the item in Mario Party, see Coin Box. Not to be confused with ? Block or Coin Block. Artwork of a ? Box from Super Mario 3D World. Worn over the character's head to earn multiple coins. Mario wearing a ? Box in Super Mario 3D Land. Toad wearing a ? Box in Super Mario 3D World.
? 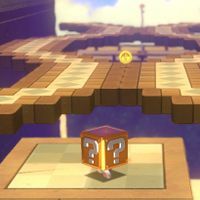 Boxes are items introduced in Super Mario 3D Land. They are only found in World 8-1, World 8-4 and Special 1-3. ? Boxes look just like ? Blocks. Like Propeller Boxes, they are worn by Mario over his head, and do not let him throw fireballs or boomerangs, or turn into a statue. It cannot be taken off unless he hits an enemy. If Mario makes it to the Goal Pole with the ? Box, it disappears and gives an extra life. While inside a ? Box, infinite coins will pop out from it while he is moving. In New Super Mario Bros. 2, similar objects known as Gold Blocks appear, which are revealed by hitting Coin Blocks enough times, and give Mario coins at a much faster rate than the ? Boxes. Unlike ? Boxes, however, a Gold Block will disappear once 100 coins have been collected from it.
? Boxes return in Super Mario 3D World, now shinier than a regular ? Block. This time, they work just like Gold Blocks. ↑ von Esmarch, Nick. Super Mario 3D Land PRIMA Official Game Guide, page 9. ↑ Musa, Alexander, and Geson Hatchett. 2013. Super Mario 3D World Prima Official Game Guide, page 15. ↑ Shogakukan. 2015. Super Mario Bros. Hyakka: Nintendo Kōshiki Guidebook, Super Mario 3D Land section, page 232. This page was last edited on March 3, 2019, at 12:42.